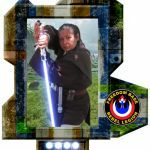 The Mercer County Public Library will host a Kick-off Celebration for Star Wars Reads Month (October) on Saturday, September 29 from Noon to 5:00 EDT. We will have movies, costume contests, crafts, games, and other activities, all to encourage young people to read. We would LOVE to have some members of the Legion in attendance to promote this event. All activities are free and open to the community. I might be able to make this not sure my car has been acting been having issues with the battery. So I can tentively say yes.